This Acacia Wood Round Tray features an engraved letter or monogram. Acacia wood is durable and a great sustainable wood for serving pieces. 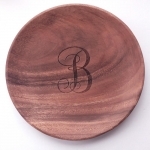 This round platter measures 10 inches in diameter. Hand wash only.